Ray-Ban are more than simply sunglasses but a way of life that have enveloped their own culture and stylish following whilst retaining a look that is high on prestige and fashion. Crafted in Italy, these Ray-Ban Aviator Sunglasses offer a classic look that has stood the test of time whilst retaining a practical and fashionable design. 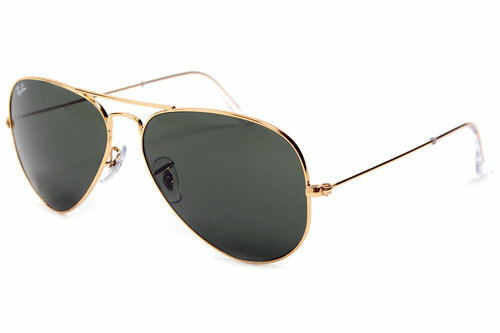 Originally developed to combat the blinding glare experienced by US Air Force pilots, Aviators merged formidable design with cutting-edge technology and changed the face of society forever. The sleek and lightweight gold coloured frame sits splendidly set aside the mirrored lenses, measuring 58mm across. As a subtle finishing touch, the iconic Ray-Ban logo is incorporated onto the lenses themselves.